Our cruise specialist reports on whether size matters on the new Royal Caribbean Oasis of the Seas – the largest cruise ship sailing the seas today. As a family travel specialist, I often preview new ships, and friends who are not in the industry will sometimes casually ask for feedback. However, the arrival of Royal Caribbean’s Oasis of the Seas — currently the largest ship at sea — has made such a splash among consumers that I have been deluged with questions ever since I participated in a pre-inaugural cruise in November. For the record, this ship and her sister Allure of the Seas, also an Oasis class vessel, are about 1,187 feet long — that’s about three football fields to you and me — and carry 5,400 passengers, double occupancy, not counting the 2,165 crew. 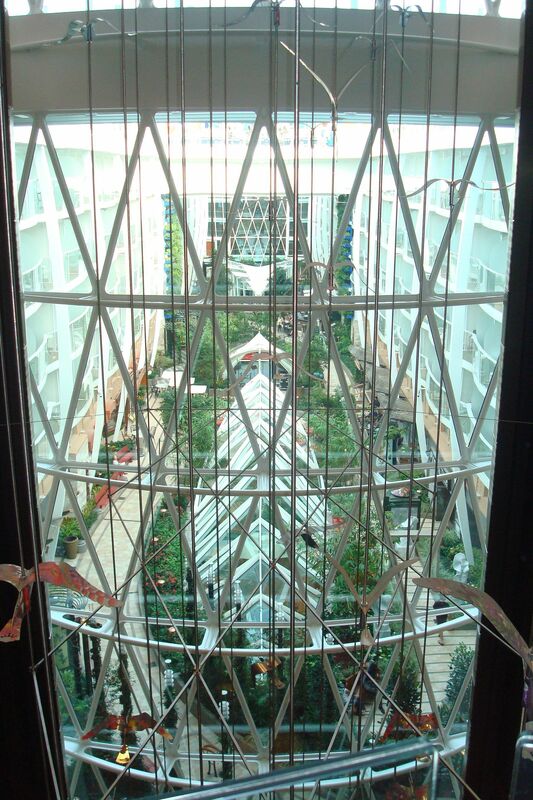 Those who have cruised on the line’s Voyager and Freedom-class ships will recognize some features, most notably the Royal Promenade, an atrium-style “street” in the heart of the ship that offers sidewalk eateries, shops and venues for impromptu entertainment. This idea has evolved on the new ship with the addition of two new “neighborhoods,” Central Park, with its lush vegetation and sophisticated vibe, and the Boardwalk, whose colorful carousel and ice cream and donut shops are likely to be a kid magnet. Best of all, these two new areas, also located in the heart of the ship, are open air, which imparts a dramatically less claustrophobic experience than on some of its competitors. Other new features with wow factor include a zipline suspended nine decks above the Boardwalk, an AquaTheater with synchronized swimming and high diving shows, and a very cool Rising Tide bar that moves (slowly) up and down the length of three decks between Central Park and the Royal Promenade. 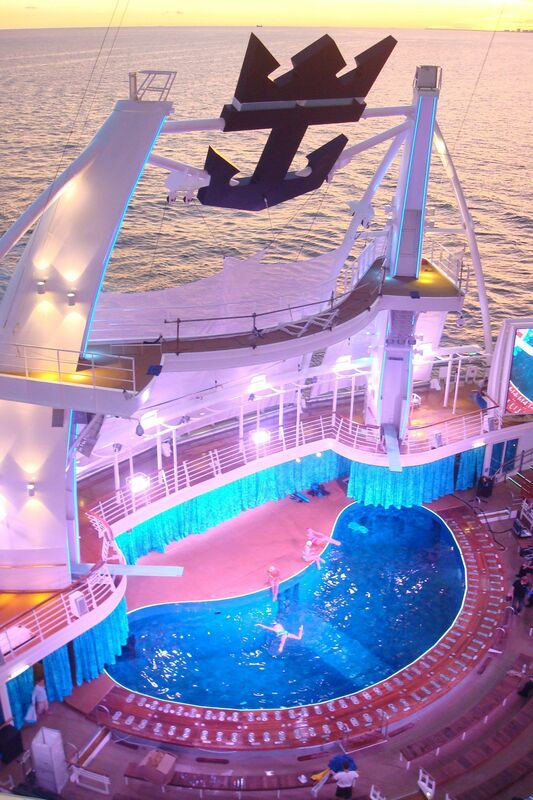 The FlowRider surf simulator and the indoor ice rink from the Freedom of the Seas also are reinvented on the Oasis. Bottom line, those of us expecting just a bigger ship found it to be so much more, and we think families will agree. And in recent news from the cruise company, the Allure of the Seas, due to set sail in December 2010, will adapt to the latest in consumer trends by changing some of the dining venues in its Boardwalk neighborhood, shops in the Promenade, and adding a 3-D movie screen to the main theater. There was a snarl up at Fort Lauderdale airport waiting for the busses, and it was unclear how much of that was due to delays caused by the “Good Morning America” taping that had taken place that morning, and how much was simply the challenge of moving that many people from the airport to the ship’s homeport at Port Everglades cruise terminal. That said, once we arrived at the terminal, the check-in process was a snap. Tip: Hate waiting for the cruise line bus? Hop in a cab for the short ride to the terminal, situated only about two miles from the airport. Be careful not to arrive too early, however, or you will find yourself standing on the sidewalk with nowhere to comfortably wait. The cruise line staff at the airport can tell you when it is safe to head out. The exterior of the ship is not as pretty as I had expected – it looks sort of like a floating high-rise apartment, thanks to layer-upon-layer of balcony staterooms (there are 16 decks in all) — but the interior is fresh and fun without a lot of the Vegas-y glamour that sometimes characterizes mainstream cruise ships. I always encourage cruisers to upgrade to an ocean-view balcony if their budget will allow, but on the Oasis, you can be flexible. There are 2,706 staterooms, 1,956 of which have balconies, in a whopping 37 stateroom categories. For those whose principle joy in cruising is sitting on their balcony scanning a watery horizon, an ocean-view cabin is still the way to go. What is innovative here is that many of the so-called interior staterooms with balconies also offer partial water views, as well as views of some of the most fun parts of the ship. Our cabin on Deck 11, for example, overlooked the Boardwalk. From my balcony, I was looking directly down at the carousel, but I could also see the AquaTheater to my left, the ocean just beyond and the open sky above. Our cabin offered some 182 square-feet of living space, complete with two single beds (that can be combined), a TV, minifridge and desk/vanity area and the tiny balcony. There are several categories of family suites and staterooms, however, ranging from 260 to 271 square-feet that can accommodate up to six passengers, as well as the posh two-bedroom Royal Family Suite with Balcony, which sleeps eight. Rant: Overall, our stateroom seemed a little small – the one complaint I heard from fellow cruisers – but the layout was economical, although closet space was tight. Most of the crewmembers were pulled from other Royal Caribbean ships, and the staff was uniformly friendly and efficient. Because this was a brand-new ship, there were a few minor hiccups, most notably slow service in the main dining room, but we suspect those were temporary. With the exception of NCL, most cruise lines usually only offer a couple of specialty restaurants, but on the Oasis you can drop a bundle trying them all. 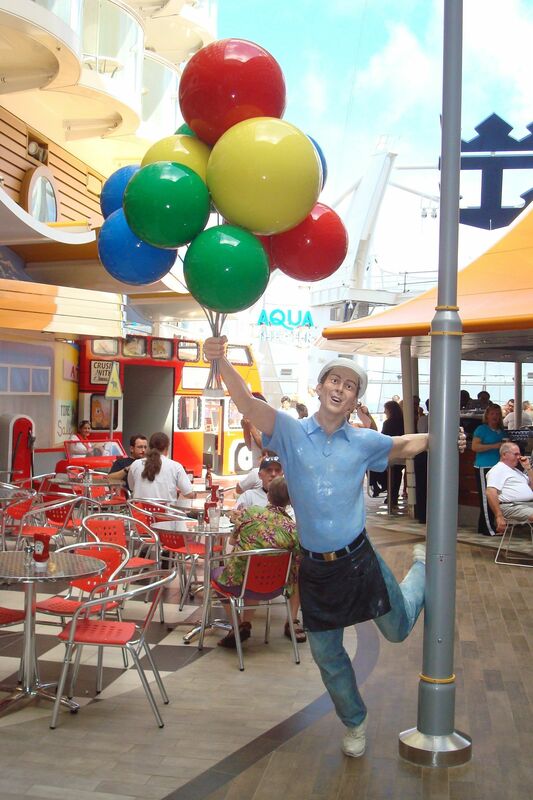 Surcharges range from $4.95 at Johnny Rockets to $35 at the most gourmet option on the ship, 150 Central Park. There are 24 dining venues in all, and if you would rather not dig into your wallet, you can dine at the main Opus Dining Room or at the Windjammer Marketplace buffet, as well as an assortment of other eateries scattered throughout the ship. Rave: You can eat at Opus whenever you want – a boon for cruisers who hate assigned seating but don’t want to spring for a specialty restaurant every night – thanks to the new My Time system that allows passengers to reserve the time of their choosing. Can’t think ahead that far? Just show up. It is a safe bet that during school vacations, the number of children on board will be staggering, something the line was clearly aware of when it designed the 28,000-square-foot Youth Zone. Not only is it huge, but there is a lot of real innovation here mixed in with the razzle-dazzle. New to this ship is the Royal Babies and Tots Nursery for infants and toddlers ages 6- to 36-months. The line has an association with Fisher-Price and Crayola, so you’ll see their products here, and the program is run by a company called Family Central. The nursery can only take 18 children at a time, and the ratio is one staff member to every three children. To give everyone an equal shot at booking some time at the nursery, every family on board is given a guaranteed number of hours if they choose to take them, while some hours are open on a first-come/first-served basis. The fee is $8/HR per child, and day and evening hours vary according to the itinerary. The Oasis also offers its trademark Adventure Ocean program, with Aquanauts, ages 3 to 5; Explorers, ages 6 to 8, and Voyagers, ages 9 to 11. Teen-only spaces include the Living Room, where kids can learn to mix tunes at the Scratch DJ Academy or go online on one of the wall of computers, and Fuel, where they can dance in their own cool nightclub. 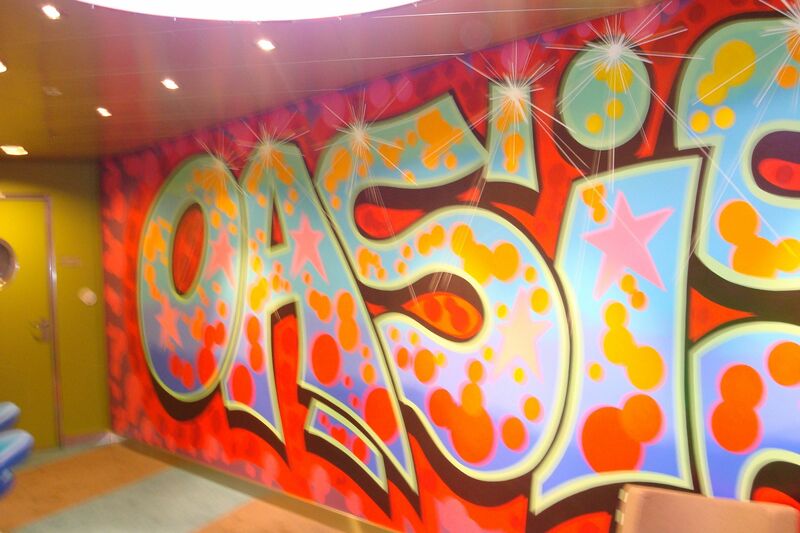 Rave: What I especially liked about the Youth Zone is that the children’s play areas are connected in a more cohesive way than on other ships. The new Kids Avenue links the program areas for kids aged 3 to 11, expanding on the neighborhood concept that characterizes Central Park and the other new public spaces. The line has also created areas where families can do things together, such as the Workshop for arts and crafts. Kids will also love the 100-seat Adventure Ocean Theater, a children’s theater overseen by John Tartaglia, who was nominated for a Tony for his role in “Avenue Q.” Other fun zones include Imagination Studio, powered by Adventure Art by Crayola; the Adventure Science Lab, and an indoor playground called Play. Tip: Consider taking advantage of a new smartphone called Royal Connect that cruisers can rent by the week to keep tabs on the kids, talk with other passengers and make reservations at specialty restaurants. Renters pay a one-time fee of $17.50 a week, and calls and text messages are free. In addition to the zipline and two FlowRiders, the Pool and Sports Zone offers four pools, an H2O Aqua Park with water features for children, a serene Solarium for adults, a multi-sport court and minigolf. The Vitality at Sea Spa and Fitness Center is a multi-level space with a Zen-like, ultra luxe atmosphere with offerings that include everything from couples massages to Botox and acupuncture. Or you can forego a treatment in favor of a few hours at the Thermal Suite – a day pass costs $10 a day — where you can relax in saunas and steam rooms or stretch out on heated ceramic lounge chairs. The Youth Spa not only offers treatments geared for children about 11 and up, but the facility has its own dedicated space within the Vitality spa. Try a 50-minute Mother/Daughter Paradise Massage or a Father/Son Chill Out Massage, both for $195, or treat your child to a Fabulously Fruity Facial, also 50 minutes for about $99. Salon treatments for youngsters also are available. The current itinerary focuses on seven-night Eastern Caribbean cruises, calling at St. Thomas, St. Maarten, and Nassau. In May 2010, a seven-night Western Caribbean cruise calling at Labadee and Cozumel and Costa Maya in Mexico will move into the rotation, with the itineraries on alternate sailings. In December 2010, the new port of Falmouth, Jamaica, will replace Costa Maya on all Western Caribbean sailings. “Hairspray” is the hot ticket at the Opal Theater, and while still free, passengers need to book ahead. You should also book ahead for shows at Comedy Live and the amazing Frozen in Time ice show at Studio B ice rink, as well as for shows at the AquaTheater. For 2010, seven-day cruises start at about $999 per person in an outdoor cabin. 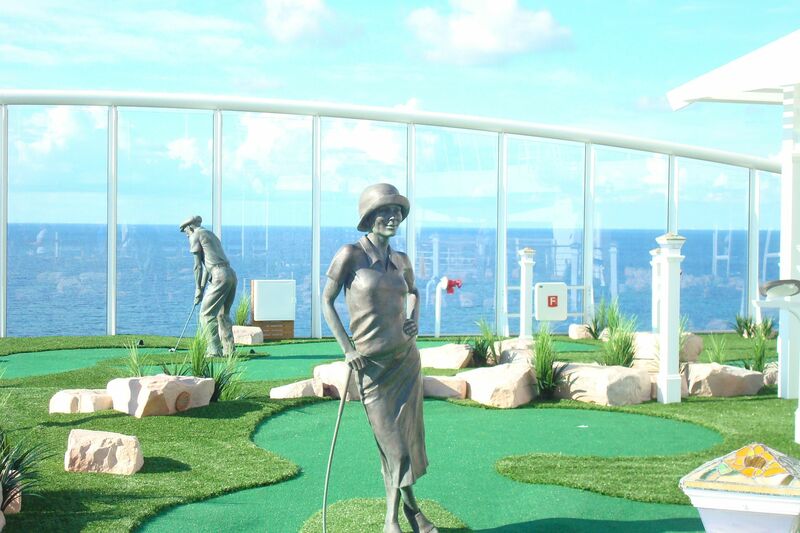 Expect to pay about $2,829 per person in the Family Ocean View Stateroom with Balcony. 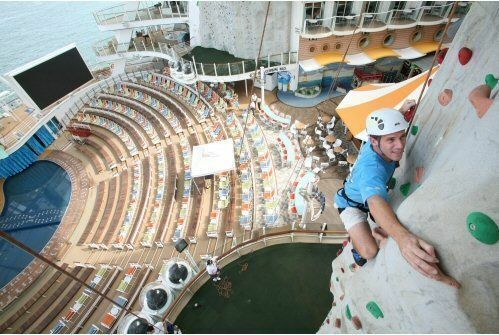 Tip: Royal Caribbean decided not to charge for some of their hottest attractions, including the zipline and the FlowRider. As a result, you can expect lines. The good news is that you will be able to book more activities online before your departure date than ever before, and we encourage you to take advantage of that option. If you really are the spontaneous type, certain blocks of time are set aside on a first-come/first-serve basis. I am interested in the carabean for children where the stay and east for free. The date will be in April but i am flexible. T he good news is that you will be able to book more activities online before your departure date than ever before, and we encourage you to take advantage of that option.